Discover the Shawnee Hills Wine Trail, Illinois’ first official American Viticultural Area (AVA) designation and enjoy luxurious lodging at nearby Illinois Bed & Breakfast Association member inns. Located in the very southwest corner of Illinois, Shawnee Hills spans the Shawnee National Forest’s western portion. Area rivers, lack of geologic glaciations, and good ground drainage make Shawnee Hills ideal for vineyards. Moreover, Shawnee Hills’ climate is similar to that found in wine-producing regions of Spain and Italy, resulting in grapes that rival those of traditional wine-making regions. Shawnee Hills’ wines are known for their uniqueness and distinct flavors only found in southern Illinois. Savor the flavors in the tasting rooms of our beautiful wineries. Tour the grounds and the wineries themselves, and pick up distinctive gifts for any occasion. Some of our wineries offer hall rental for special gatherings and celebrations. For your extended Shawnee Hills Wine Trail exploration, try an area bed and breakfast for your lodging needs. 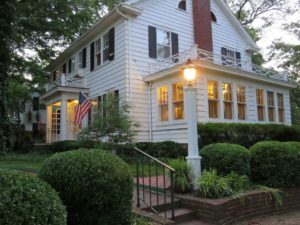 Member inns of the Illinois Bed & Breakfast Association provide the perfect atmosphere for your viticulture adventures!